Vitamin A, also known as retinol, is essential to the formation of visual purple in the retina, which allows vision in dim light. Beta carotene, the precursor to vitamin A found in vegetables, has antioxidant properties, meaning it protects cells from the toxic damage of oxidation. 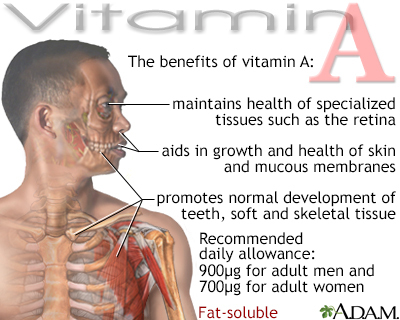 Excessive amounts of vitamin A increase the risk of fractures.